1 day of the dead tattoos | This Blog Rules | Why go elsewhere? 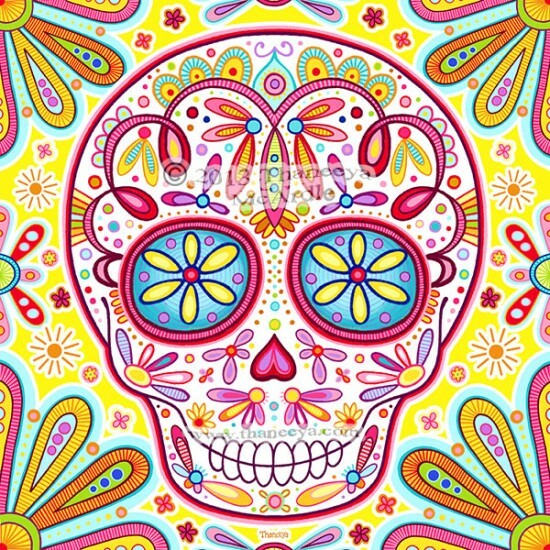 The Day of the Dead, or Dia de Muertos, is a holiday originating in Mexico that lasts for three days, between 31st of October to 2nd of November and has as main focus the remembrance of loved ones who have passed away. Being associated with a particular aesthetics, such as skeletons, skulls, flamboyant costumes and colourful flowers, as well as specific food, most notably sugar skulls, the holiday has spread its influence beyond Mexico, often losing most of its meaning in the process. Nonetheless, the holiday has become a household-name in the United States and elsewhere, where it maintained its unique semblance and deconstruction of morbidity, an aspect that has left an important mark on the visual arts. The following list tries to cover the history of the Day of the Dead in art, both traditional and less so. 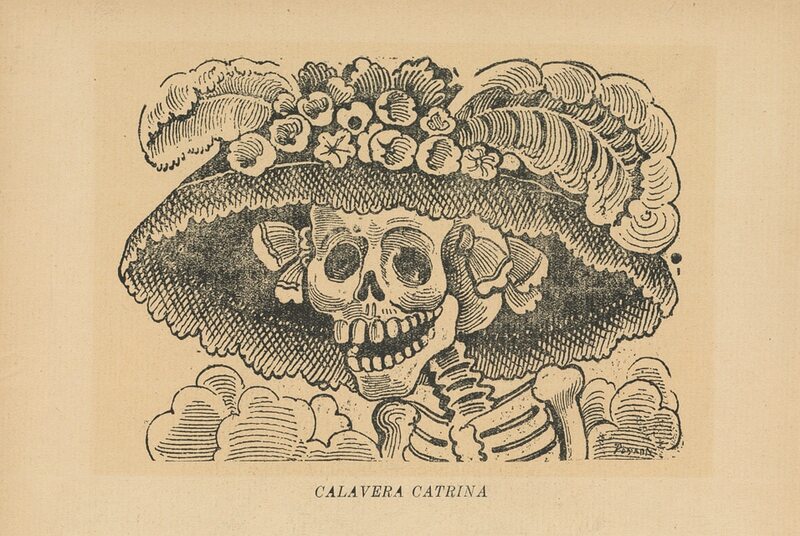 The original etching of “La Cavalera Catrina” (The Elegant Skull) is not so much inspired by The Day of the Dead, as it is an inspiration upon it. Created by José Guadalupe Posada in the 1910s, it has become one of the most iconic images of Death in Mexico and has started being used in Day of the Dead celebrations. Its initial subtext was to mock the aspirations Mexicans had for the customs of the European aristocracy. This ceramic folk art depicts Mexican painter Frida Kahlo with Day of the Dead hair decorations, in homage to her famous self-portraits. 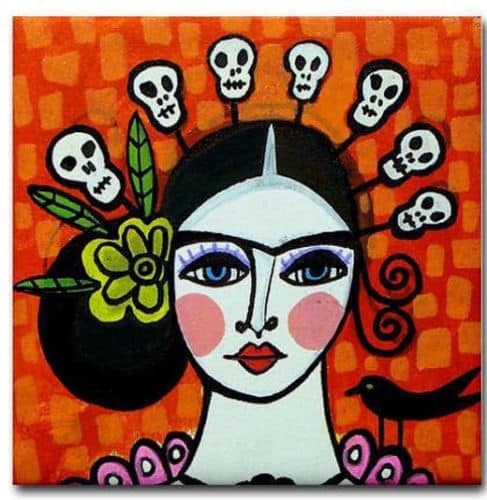 Beyond the obvious Mexican connection, Kahlo has even more links to the iconic elements of the Day of the Dead, being her husband, Diego Rivera who has painted the surrealist mural “Sueño de una tarde dominical en la Alameda Central”, which further cemented La Cavalera Catrina in the Mexican folk characters pantheon. Building on elements that were already there, such as surreal images of skulls and powerful colours, it is often that Day of the Dead drawings are given a further psychedelic edge. This example, by Thaneeya McArdle, perfectly illustrates this trend, bridging the traditional Mexican motifs with a 1960s American flower-power look. 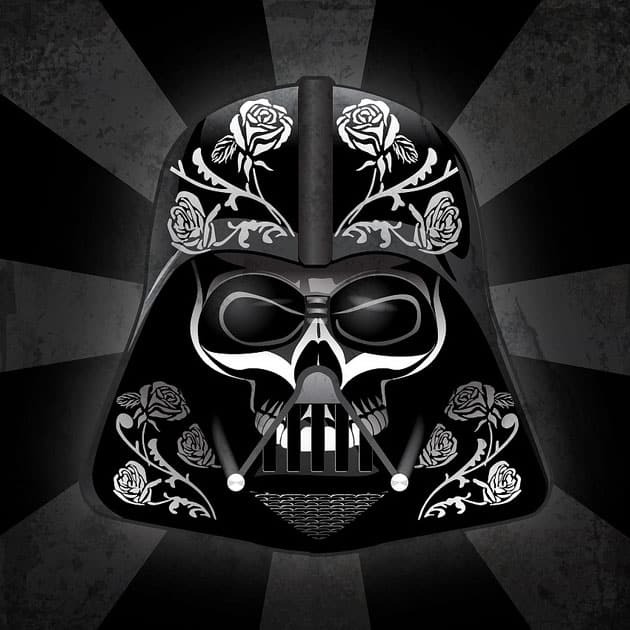 We don’t know if the Day of the Dead is celebrated in a galaxy far, far away, or what it’s translation in Wookiee would be, but we do know that this Darth Vader mask with Día de los Muertos motifs, part of a series by John Karpinsky, would make a great decoration for a motorcycle helmet. This one’s a bit cheeky, but since video games are starting to be rightfully recognized as an art medium, Grim Fandango deserves to be here. 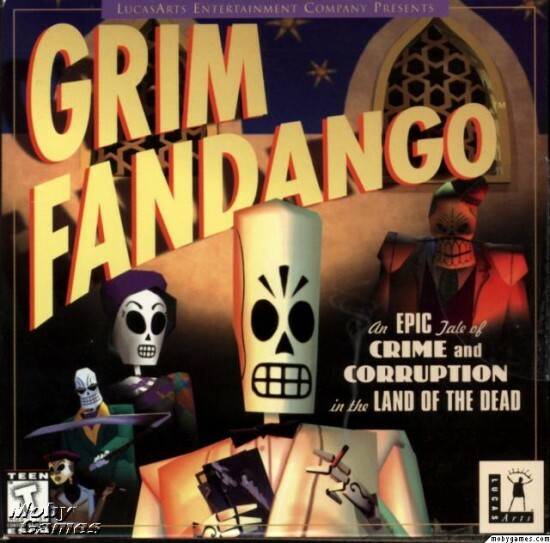 An adventure game which draws many of its ideas and aesthetics from the Day of the Dead, from the Aztec belief of afterlife to the omnipresent skulls, Grim Fandango is the, by far, the game of the Halloween season. Probably among the most famous tattoos in the world, Rick Genest’s full-body skeletal art piece is clearly inspired from more traditional Day of the Dead makeup. The unusual tattoo made Genest‘s face instantly recognizable and even landed him a few movie roles and cameos. 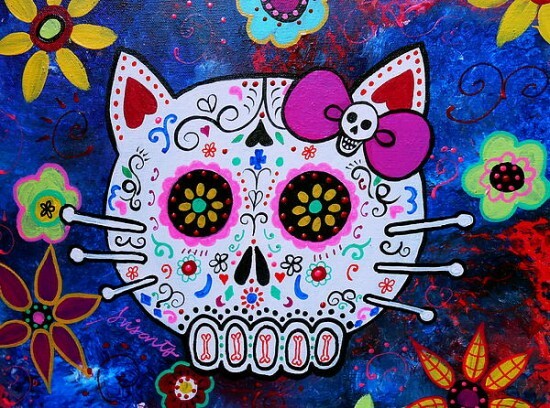 In a combination of two of the most recognizable cultural exports from across the globe, Californian artist Pristine Cartera Turkus has created a Japanese – Mexican connection though art, painting the striking “Hello Kitty Day of the Dead”, telling of the way that the holiday has long since exceeded the borders of its native Mexico or even those of the Spanish-speaking world. 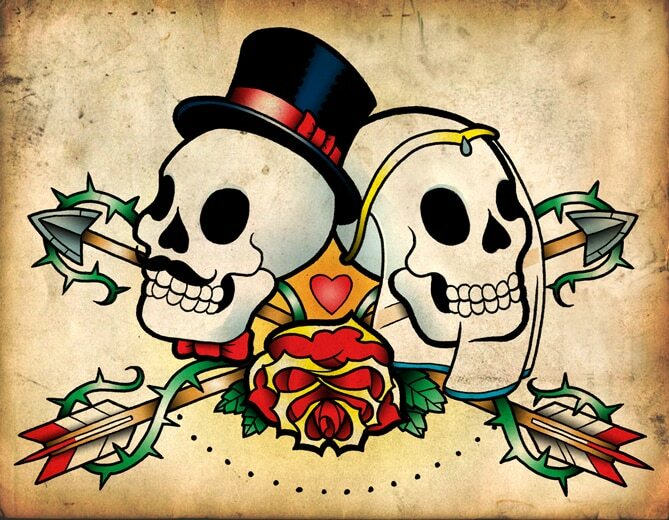 Deviantart user scumbugg designed this neat picture to adorn the invitations of a Day of the Dead-themed wedding. In recent years quite a few couples opted for this theme for their wedding decorations, taking advantage of the myriad of costumes available for men, women and children, as well as the ability to keep the party at least semi-formal.